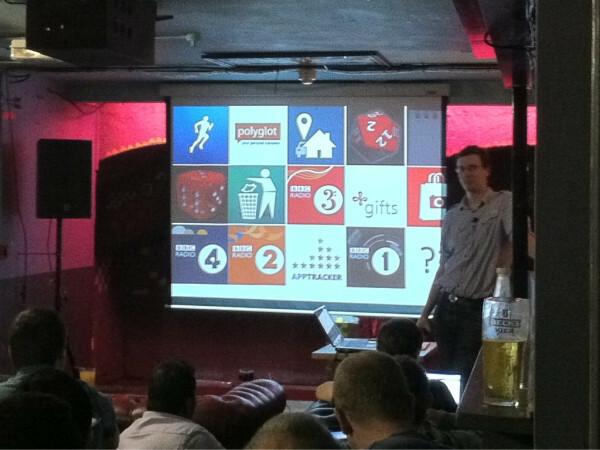 Last night was the 11th meeting of the Windows Phone User Group and it was another successful event. 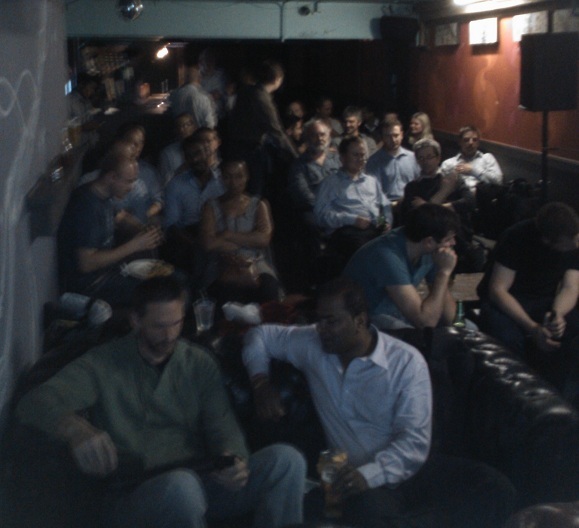 About 40 of us filled the basement of our regular venue (Juno bar in Shoreditch) to talk #WP7Dev. This month we heard from a number of people demoing apps they had made plus sharing some of the lessons learnt in their creation and their plans for new updates and features using the Mango tools. First up was Mark Rendle who showed Pocket C#. This was one of the winners of RedGate’s WP7Comp. Secondly Paul Marsh showed us Steam Achievements. Next up was KeyboardP who showed us 2 simple apps he’d released (including Songs Alike) as part of an experiment into application optimization. He also shared some very interesting tips on application pricing. The evening didn’t end there though. Many of us stayed to chat and share development tips, tricks and experiences late into the night. Unfortunately we had a bit of noise coming down from the band playing upstairs but the presenters all coped marvellously. We will be doing everything we can to prevent this affecting us at future events. Videos of each of the demos will, hopefully, be available soon. Meanwhile, why not download the apps and try them for yourself. Great meet, thanks for making us very welcome and letting us demo AstroSwag and InterSceptre (and all the feedback that followed) – some very cool apps, got us thinking a lot for future releases! Looking forward to the next one… just hope there’s no band! Okay, so i learnt never try and demo a speech recognition technology while their is a band playing up stairs… But just to prove it works i have a video now here http://wp7.apporista.com/free-whatis/ and you can download it with this zune link http://social.zune.net/redirect?type=phoneApp&id=96176725-2ba0-e011-986b-78e7d1fa76f8 to try it for yourself.